Not only is nausea obnoxious, it can also be completely unbearable leading to full blown vertigo during cancer treatment. Don’t let yourself get topsy-turvey on an overturned stomach. There are many well established ways to combat nausea that range from herbal traditional remedies to modern prescription medications. In addition to this, I teach in my cookbook, Cooking for Chemo …and After! about the sensory and taste changes that occur for cancer patients during chemotherapy. 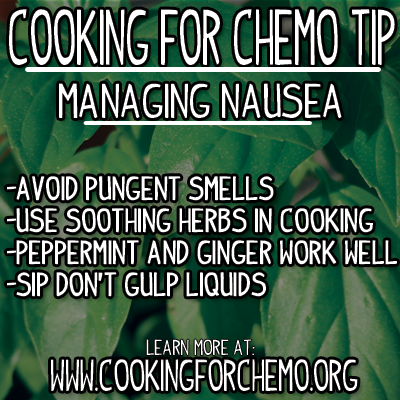 I talk about how these changes can cause nausea if you are not careful to take them into consideration when cooking. For ease and convenience, I have broken these various remedies and techniques down for you for personal consideration. Talk to your oncology doctor about your nausea. More than likely they can prescribe a variety of medications that treat a variety of nausea intensities. When my mom went through chemotherapy treatments, she had two pills she could take: one for moderate nausea and one emergency pill for severe nausea. Remember though, that all medications have interactions and undesired side-effects so make certain to cover these with your oncologist to choose the best selection. There are many options for herbal and folk remedies that have been time tested to combat mild nausea during cancer and chemotherapy treatments. Here are a few of my recommendations that worked for us. Peppermint: Available in the form of tea and candy, peppermint has long been used as a folk remedy for nausea. I can say that it does work for mild to moderate nausea. For us, it seemed to be that the peppermint candies or breath mints worked a little better than the peppermint teas. Ginger: A classic sore stomach soother. Ginger, which originated in east Asia, has been in use for thousands of years to sooth a sore stomach. Available as a fresh root, a dried powder, a tea or in soda form; Ginger does in fact work for mild to moderate nausea. Be warned in advance though, ginger is in fact a warm spicy flavor, not a mild sweet flavor. Its warm spicy taste often takes people by surprise! Sipping liquids: For mild nausea, a warm cup of soup broth to sip can help to set you right. In addition to this, soup broth has a caloric value which can be extremely helpful for those having trouble getting necessary nutrients into their bodies during chemotherapy treatment. You can also slowly sip water, which can help with mild nausea. Make certain not to quickly drink the liquids, as the upset and sudden influx of fluids can cause the inverse of the intended effect and cause you to become extremely nauseous! Rubbing Alcohol (isopropyl alcohol): This is a technique that a post-surgical nurse taught me. When you are extremely nauseous take a cap full of rubbing alcohol and smell it. Do not snort it! Do not drink it! But take a few sniffs of the fumes, and it will immediately settle your nausea. This technique does not work for everyone, but for those whom it works, it does work extremely well. As the old expression says “an ounce of prevention is worth a pound of cure.” So is this still true today? While not all nausea can be avoided, here are a few ideas and techniques that you can try to employ in your everyday life. Avoid Pungent Smells: Pungency is a principal that has to do with the strength of odors. Whereas smell describes the character of an odor, pungency has to do with the strength irregardless of the pleasantry. For example: Roses have a low pungency and it can be hard to detect their scent. Inversely rotting fish has a very high pungency. Foods that have high pungency can induce nausea more easily than foods with a low pungency. The perfect example of this is canned tuna. During chemotherapy the smell of canned tuna, even from a great distance, would make my mom nauseous. Use soothing herbs in your cooking: Rosemary, sage, thyme, basil, and parsley all have soothing scents that can help to keep nausea from occurring while eating. Hopefully these tips and techniques will get you started on the right path to not only combating nausea but avoiding it entirely. 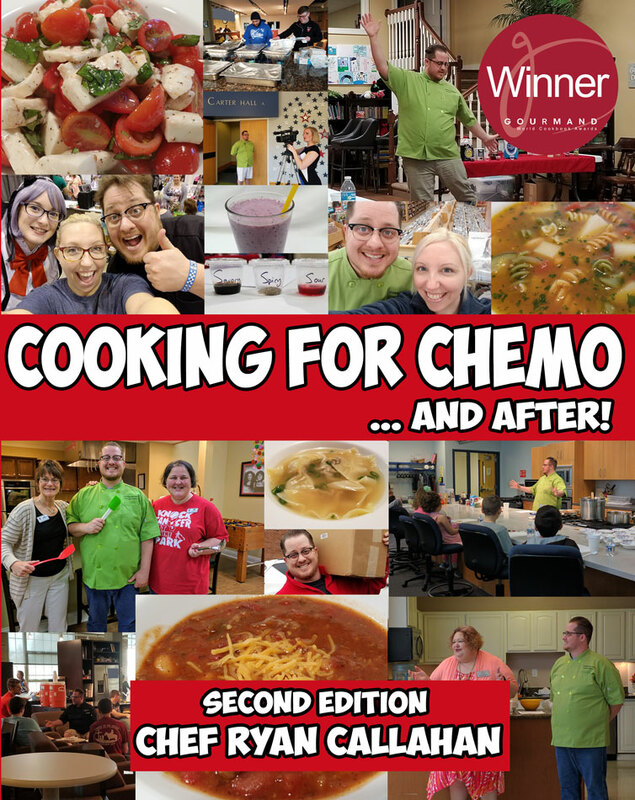 For more information on the cooking techniques, you can purchase my cookbook, Cooking for Chemo …and After! by going to Amazon or Barnes and Noble.